"The 4Front is so comfortable, and the all-terrain features help me enjoy Fort De Soto Park." Victoria Lynn Shearer loves the suspension on her 4Front® Power Chair because it allows her to spend time at local parks and beaches near her home. Nothing stops Victoria Lynn Shearer from enjoying her life in St. Petersburg, Florida. As a bilateral above-the-knee amputee with a C2 spinal cord injury, Victoria has overcome a lot of challenges. 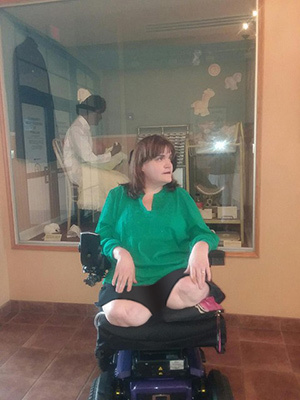 She desired a power chair that would meet her needs. “I wasn’t impressed with anything on the market until I saw the 4Front,” Victoria said. Victoria loves the 4Front’s suspension because it helps her live a full and active life. She enjoys the outdoors and recently toured some of the local parks and beaches near St. Petersburg. “The 4Front is so comfortable, and the all-terrain features help me enjoy Fort De Soto Park,” Victoria said. 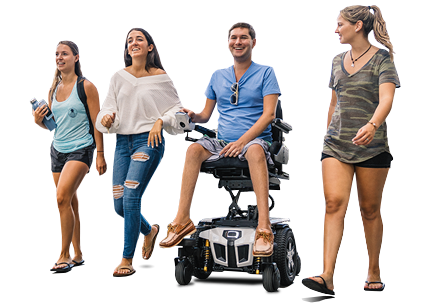 The 4Front makes trips to the doctor more convenient with the power adjustable safe seat elevation, as well as the recline feature. The elevation also allows Victoria to participate in drum circle, which she really enjoys.